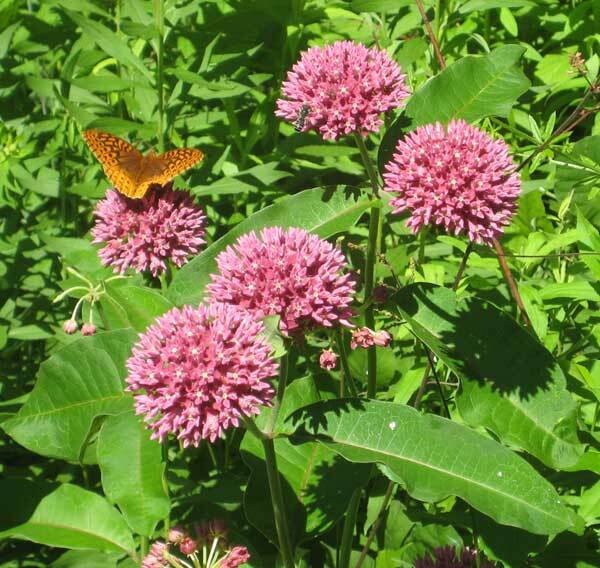 Mid- to late-June is when the endangered purple milkweed (Asclepias purpurascens) is in full flower. This savanna indicator has responded well to restoration work at Pleasant Valley Conservancy and has become one of our signature species. 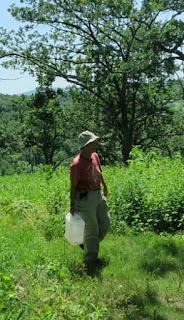 Last Thursday, Kathie, Susan, and I did our annual monitoring. All plants are permanently marked and have been under study for a number of years. We now have 20 sites where purples have arisen spontaneously and 14 sites where greenhouse-raised transplants are established. Each site has one or more stems, in some cases more than a dozen. This year 85% of the stems had flowering umbels, which is typical. Last year we had similar success, but the great drought started in mid June and all the purples collapsed. We did not get a single successful seed pod. Happily, this year's observations show that there was no permanent damage. Hopefully the good rains now occurring will be beneficial and we will get excellent pollination and some seed pods. Although I have seen purple milkweeds at other preserves in open prairies, at PVC all of our sites are in areas with partially closed canopies (average about 50% canopy cover). We have good populations in both white oak, bur oak and Hill's oak savannas. We saw our first purple milkweed flowers in 1999, in a small savanna area that had just been cleared and burned. Purples are still flourishing at this site today. Although purples are not common in Wisconsin, they are surprisingly easy to raise from seeds. Seed germination is very high (in our hands >90%), and seedlings can be easily raised in either a greenhouse or under lights. Details of purple milkweed culture can be found in the paper I published in Ecological Restoration. Download this paper (PDF) published in 2009. Great year for Echinacea pallida! 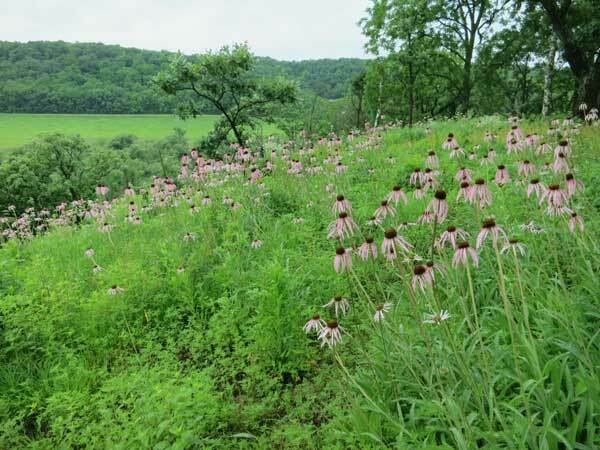 Whether it's the rains, or some strange legacy from last year's drought, pale purple coneflower (Echinacea pallida) is having a banner year. This year areas where in the past we have seen only a few plants have dozens of flowering stems. Even areas where we have never seen plants before are full of flowers. And right now this species is at its peak. Although this species is considered Threatened in Wisconsin, it seems to be surprisingly easy to grow. Because it is showy, it is almost always included in prairie seed mixes. We have used it in every prairie we have planted at Pleasant Valley Conservancy, and it has always become established. We have also been able to establish it from seeds in open savannas. In some areas it has spread on its own by self-seeding. Our most dramatic area is shown in the photo below. This is at the edge of the dry prairie remnant near the overlook at the top of the south-facing slope. For about 10 years ago we have had a few plants growing here from seeds, but this year there has been an explosion. Why now? One possibility is that the few plants here have been self-seeding the area and this year conditions have been just right for an explosion. We have been raising uncommon prairie and savanna forbs and grasses in the greenhouse for the past 7 years and transplanting them to the field. This is a fairly time consuming process, but is more certain than throwing out seed. This has been fairly successful. The focus has been on species that are endangered or of special concern. This year species that we have transplanted include prairie bush clover (Lespedeza leptostachya, federally endangered), purple milkweed (Asclepias purpurascens, state endangered), and upland boneset (Eupatorium sessilifolium, threatened). Past experience has shown that these species transplant and become established well as long as we choose the right sorts of habitats. In addition, this year we have set out other species for which we had a lot of seed, including silky aster, New Jersey tea, purple prairie clover, prairie thimbleweed, prairie dropseed, woodland thistle, prairie phlox, pale purple coneflower, and Sullivan's milkweed. A numbered flag is placed next to each transplant, and we set up an Excel spreadsheet for monitoring. We have been following transplants since we first started in 2006. Since the flags burn up, each flag has a numbered fire resistant porcelain insulator at its base. Soon after we finish burns in the spring, the white insulators contrast well with the black soil and are easy to find. If a plant doesn't establish, or dies out later, its flag and insulator are pulled. However, we have quite a few plants from the earlier transplant periods that are still alive. Depending on the weather, we may or may not have to water the transplants. In the early stages of transplanting, we water once a week whether it rains or not (this year the rain has been cooperating well). A checkmark is placed next to each flag number in the database as it is watered. That way we make sure we don't miss any plant. As the growing season goes by, we monitor the results. Some species from past years that have become established well are cream baptisia, prairie dropseed, and butterfly milkweed. Last year’s drought is gone but its effects are still with us. Black Earth Rettenmund Prairie took a major hit and the whole preserve has been utterly transformed. 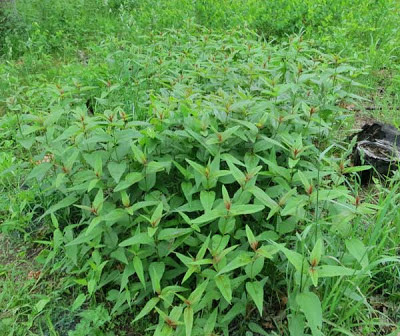 Several serious invasive plants that were minor or nonexistent before are now taking over. These include smooth brome and quack grass, two of the most difficult nonnative grasses to get rid of. However, the post today concerns tall hawkweed (Hieracium piloselloides), a native of Europe which we discovered at Rettenmund for the first time this year. Typical of most hawkweeds, this species forms a rosette of leaves at the base, sending up a flower stalk with clusters of small yellow flowers. It is clonal, and the whole colony spreads rapidly via rhizomes. How do we know this is a new invader? 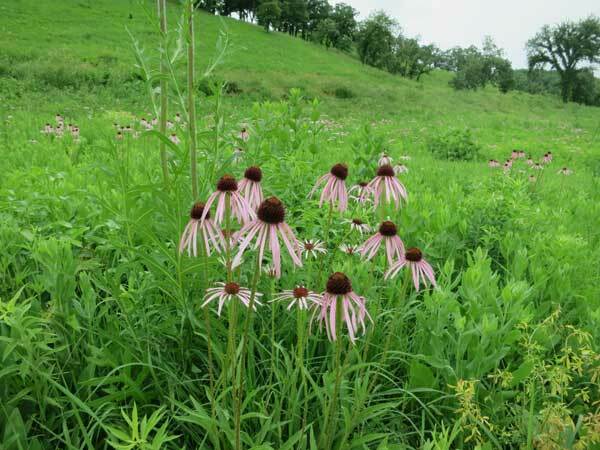 The flora of Black Earth Rettenmund Prairie is very well known. The first detailed flora was done in the 1950s by Anderson, a Ph.D. student of Curtis. 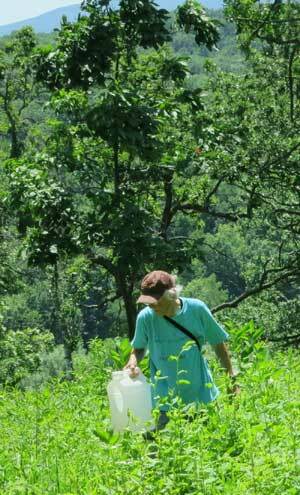 Robert Reed from the Wisconsin DNR did another detailed flora in the early 1970s, and Rich Henderson did another in 1986 at the time the site was acquired by the Nature Conservancy. Sarah Kraszewski did another flora in 2005 for her Master’s thesis, and Kathie and I have done another since 2006. It is likely that if such a conspicuous species as tall hawkweed were here it would have been recorded. Rettenmund Prairie is predominantly a dry prairie and last year many species took major hits from the drought. Especially the major prairie grasses such as little and big blue stem were killed, and there were large bare areas where they should have been. Tall hawkweed is a prolific seed producer and almost certainly colonized some of these bare areas. It is able to spread rapidly across dry, open fields and meadows and presumably became established last summer. It may have formed a few flowers but not enough for us to spot it. Suddenly this year there are two large clones in the north unit, the legacy of last year's growth. One is on the knoll at top and the other is near the north lane and hence visible from Fesenfeld Road. How do we get rid of it? According to Betty Czarapata’s book on Wisconsin invasive plants, it is a difficult plant to control. Since it is a perennial, hand pulling and mowing are a waste of time. Use of a broad-leafed herbicide is recommended, but this may be difficult since there are no leaves to spray on the flower stalk. Spot spraying each rosette will be necessary. However, herbicide residue will almost certainly transfer to the soil, slowing down the recolonization with native plants. At present we are inclined to wait and see what happens. Perhaps if we have a couple of good wet summers, native plants, including the prairie grasses, will reestablish and outcompete the hawkweed. Otherwise…? Last year we thought we might be able to keep woodland sunflower under control, but this year it is worse than ever. Perhaps the long, cool spring is responsible. The scene is especially bad in what we sometimes call the Basin Savanna, the area just above the Pocket Prairie. This is predominantly a white oak savanna, although there are scattered bur oaks. The photo here is an example of what this area looks like when the sunflower gets to spread its wings. Large clone of Helianthus divaricatus. So dense that no other species can compete. 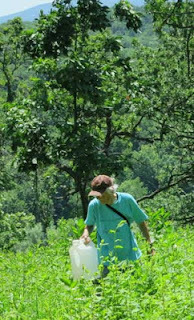 We are learning how to control this plant, although it is time-consuming and expensive. Pulling is completely ineffective since pieces of rhizome are left behind and quickly send up new shoots. Spraying of the whole clone can be done. 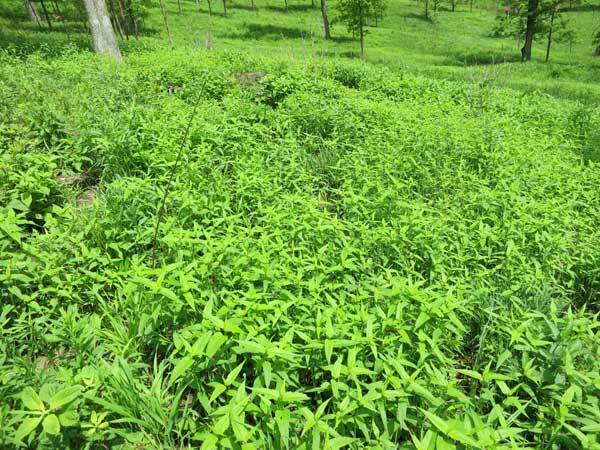 (Any herbicide that kills broad-leaved plants will work.) However, killing the whole clone leaves behind a large bare area in which other invasives can become established. Seeding the bare area with "good" species can be done, but the natives take several years to get established and in the meantime undesirables such as bluegrass or smooth brome generally take over. A small clone in which every plant has had the herbicide spritz (note red areas). A woodland sunflower that has come up inside an area of the endangered purple milkweed. 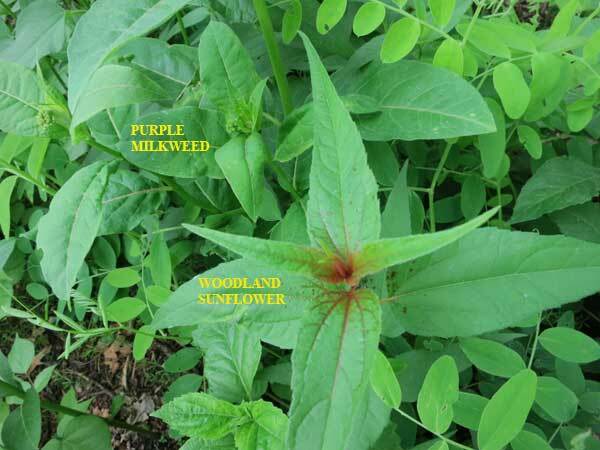 The sunflower plant was carefully spritzed so that the milkweed was protected. We are at the beginning of a long process. In 2009 we located 76 sunflower clones by GPS. Many of the smaller clones have been eradicated, but the large ones are still present. Our preferred control method now is to use the herbicide spritz on the circumference of a clone, thus stopping it from spreading. This won't eradicate the clone but will keep it under control. We have lots of Baltimore orioles. They like open woodlands and forest edges, which is what we have a lot of at PVC. Among other locations, they are common around our cabin/shack. Among other things, they are attracted to the fresh oranges Kathie and Susan put out on the special feeder (see Kathie's photo). 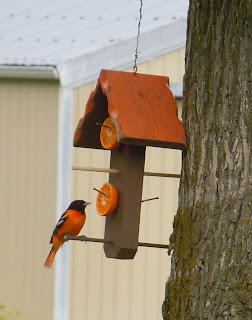 This orange feeder was made by Susan’s dad and is a fitting memorial to his interest in birds. 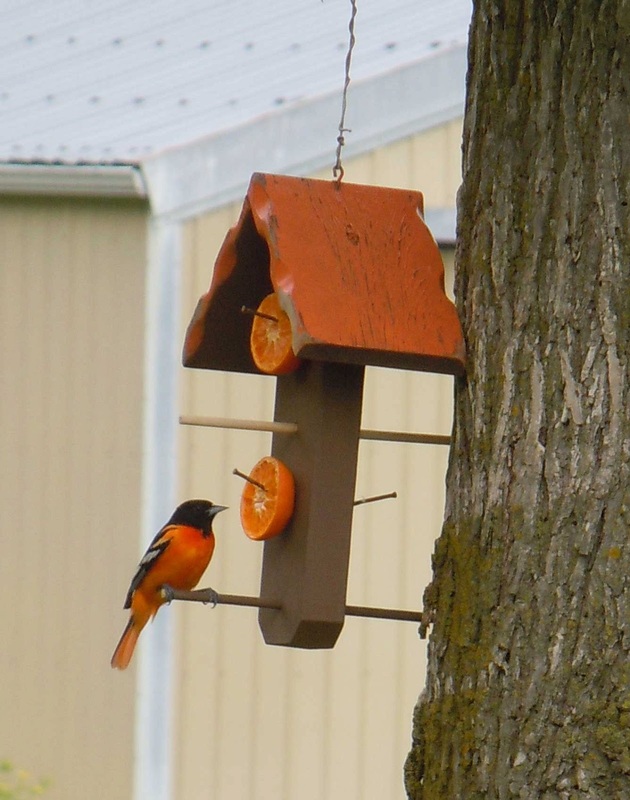 According to sources, the orioles especially feed on fresh oranges soon after they arrive back in the spring. The idea is that after the long migration from the neotropics they seek out sources of sugar to replenish their reservoirs. I was interested to learn from the Cornell Ornithology web site that a favored food of the oriole is the tent caterpillar moth, since we have had a lot of these in the wild cherry trees around the cabin the last several years. At PVC we also see orchard orioles, a Special Concern species. This is another forest edge species. According to the Wisconsin Breeding Bird Atlas, the orchard oriole often nests near Eastern Kingbirds, which makes sense since we've been seeing lots of kingbirds lately. See this link for details on birds at PVC.